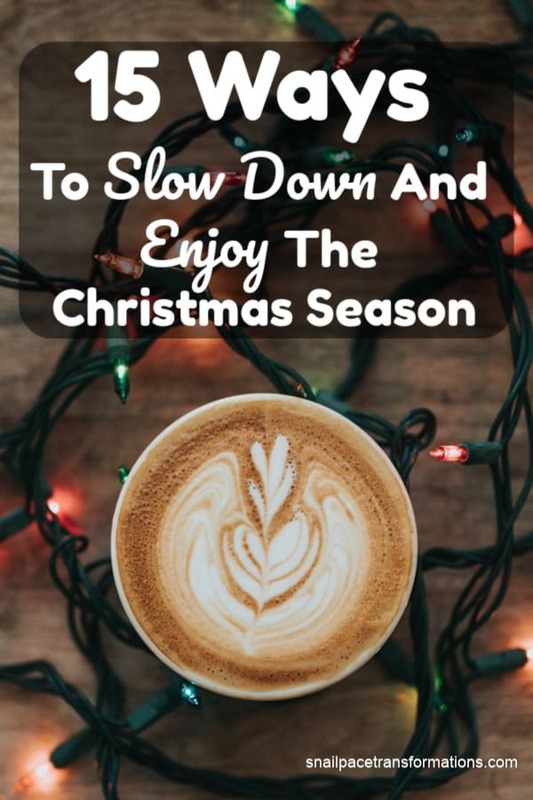 Are you desiring a slower paced Christmas season? Do you desire downtime for self-care and more moments to cherish loved ones? 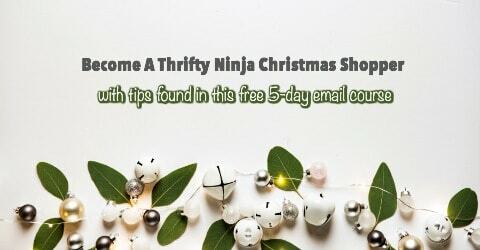 Do you not want this holiday season to become a repeat of last year where you feel like you hit the ground running a few days before Thanksgiving and never stopped until the day after the big New Year’s party you hosted? It can happen! 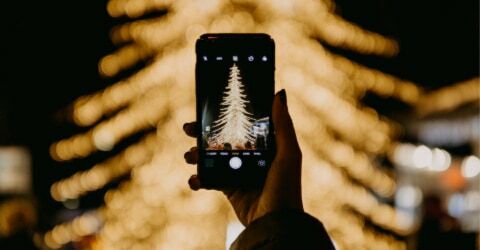 You can have a slow and enjoyable Christmas season with time to rest and soak up the wondrous moments of the Christmas season. 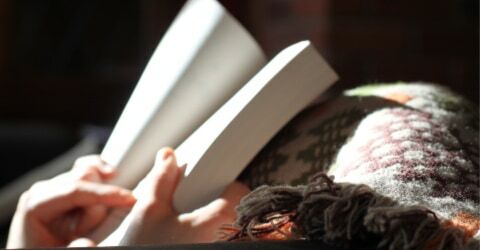 Before you start reading this list, go and grab a pen and a pad of paper because enjoying a slow season means you need to be intentional on how you spend your time –and that requires a plan. 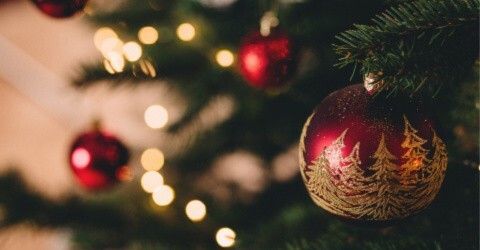 What were three things you did last Christmas season that you absolutely loved and want to do again? If you have a family living with you, ask each of them to name two or three things your family did last Christmas that they feel is a “couldn’t live without” priority. What events didn’t make anyone’s list? What showed up over and on everyone’s list? Say yes to those things and the things that didn’t make the list–say no to those. Now obviously this isn’t a clean-cut process, sometimes the feelings of extended family that don’t live in your home have to be considered. But if your family has visited the local light show for years and it didn’t make anyone’s list and you don’t go to it with anyone else–well that event and others like it can be easily cut and the time used to slow down. With the essential events now decided, go ahead and pencil in the dates for those events on your calendar. Now take that same pencil and schedule a full day of doing nothing as well as at least one evening a week from Thanksgiving through New Year’s (or from December 1 through January 1 for those of you not living in the States). You can move these evenings and the day around as other events come up that you want to take part it, but they have to stay somewhere on the schedule. Meaning if you are down to just one spot for your day hanging around the house, you can’t take on any more activities–you are booked. You can make this a personal activity or a family activity. If it is just you, pick out a special notebook, perhaps a red one or a Christmas-themed one. Each day fill a page with three to five blessings that happened to you that day. Maybe one of the children did something nice for their sibling, you realized how amazing the Christmas tree smelled, or you bought a yummy apple pie. As a family, you could go around the table each night and say out loud one thing that happened during the day that each person thought was a blessing. Once I started listing blessings, I began to notice myself slowing down to appreciate the little things more. My guess is this will happen for you as well. Listing blessings gives us the gift of slowing down and cherishing the moment. Similar to counting blessings is enjoying the views of the season. When you see a beautiful light display while out running errands, don’t just blow right by. Instead, if there are no cars behind you, slow down and take a few seconds to enjoy the work the homeowner put into their display. If you eye your child marveling at the Christmas tree–stop and soak up their facial expressions. For the month of December set limits with yourself for social media. Spend perhaps five minutes in the morning, five at lunch and another five at dinner and then the rest of the time stay off it! Set a timer and make yourself keep to these limits. Spend the time you save (and yes, most of you will save time) with people in real life. Meet a girlfriend for coffee and leave your phone in your purse. Make cookies with the kids and no matter how big the urge is to snap photos and post them automatically to Instagram–resist it. Take pictures, they are great for memories, but post it in your next five minute social media session. Stay in the moment! Stop giving precious time with loved ones to social media. Multitasking is great in some situations, but in others, it takes away from the moment. Instead of folding clothes while watching an animated Christmas movie with the kids, sit down and snuggle up with them. Even if it is just for 15 minutes at the end of a long day, spend it unplugged. No TV, no smartphone, no music app, no audiobook, just you with your feet up and a favorite cup or glass of whatever and nothing but the Christmas tree to stare at. Spend the time reflecting on the year past and the year ahead. Spend this time dreaming about what could be in the year ahead and remembering all the beautiful memories you have made this year. Looking for a simple hot cocoa recipe to make and enjoy? Here is mine–it uses just three ingredients and tastes great! If you are not a Christian, skip this step, but for those of you who are (and I am included as one) make sure to spend time meditating on the real reason for the season. Find references of the birth of Jesus in your Bible and read them each day. Or grab a devotional and read it each morning. Last year I started this coloring devotional and I loved it so much I plan on re-reading it again this year, plus I still have a lot of coloring left to do in it. A few years back I went through this devotional, and my heart was deeply touched by it. In today’s social media age I think we have taken competition and comparison to a whole new level. Suddenly our “good enough” looks like a “never good enough” when compared to the polished pictures on Instagram. But that is just it; the images are polished, cropped, and taken at that small moment in time when everything looks perfect. They are brightened, highlighted and only show a little slice of life. Stop comparing and competing and start focusing on what matters to your family–chances are that is not having the best-decorated anything. I bet they don’t even care about having the best tasting or the largest, what they care about is being loved by you. 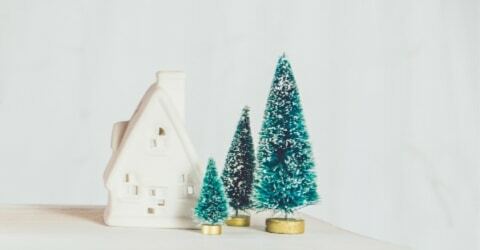 Make sure there is at least one room in your home that feels like a holiday haven to you. One that has a place where you can snuggle up, preferably under a cozy blanket and with a view of the fireplace or Christmas tree. Bring the scents of the season to life with quality Christmas scented candles or an essential oil diffuser and holiday essential oils. Splurge on your favorite holiday blend of coffee or that fantastic cocoa mix you love. Pick up some holiday creamer, candy canes, mini marshmallows and whatever else you like to stir in your coffee and cocoa. If you are more of a tea drinker, pick up a holiday blend and some sugar cubes. Way back in step one of this article I told you to figure out what you and your family loved about the holiday season and do that. Let go of the rest, downsize and delegate out what you can’t. Here is an example of downsizing. Perhaps you have been known to bring homemade cookies to every holiday gathering, but every year this stresses you out. Instead of homemade cookies this year for every party, try a simple no-bake treat or buy pre-made sugar cookie dough. You could even hit the bakery section of your local grocery and bring a dozen or so pre-made cookies. As for delegation, perhaps you have decorated the house for years, but this year you are just not up to the challenge. Bring out less and let the children do it or at least help. It might not look like you think it should, but they will love it even more. Even when it is cold, a walk outside is good for your physical and mental health. Bundle up and get out there! Aim for a 30 minute walk each day. Or if you can’t go outside, join a yoga class or another fitness class and enjoy working out with other people. Of course, the exercise doesn’t have to be the same each day. Sledding, snowball fights, and snow angel making all count! Get out there and have fun. Every year I like to pick one Christmas themed fiction or non-fiction book to read starting on December 1 with the intention of ending it by Christmas day at the latest. One fiction title that I particularly enjoyed was The Red Glove Collection. A nonfiction Christmas read that is very thought-provoking was The Purpose of Christmas. A Christmas movie with the family enjoyed at home can be just what you need to escape the hustle and bustle of the season and get your holiday spirit back, but I want to encourage you also to take the time to watch your favorite Christmas movie, even if the rest of the family doesn’t enjoy it. One evening curl up and watch your favorite Christmas movie. Indulging in what you love once and a while isn’t selfish, it’s called refueling. 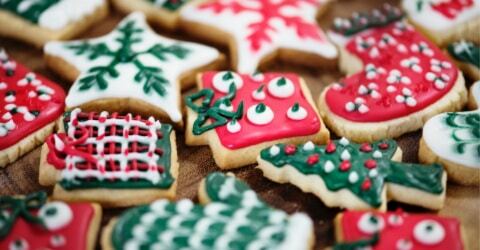 Now take indulging in yourself one step further and bake up or buy your favorite Christmas treat–even if the rest of the family doesn’t enjoy it. Every year I do this. I buy a log of chocolate covered marzipan and each day for several days I savor a piece of it. No one else in my family likes it, but I do and I don’t feel like I have to go without just because I am stuck eating it all. The more, the better! I am worth indulging in. I also make sure not to just to cut a piece and stuff it in my mouth. I sit down with my piece and savor each morsel distracted by nothing but the sound of my “mmm’s” as I enjoy each bite.